Our percent yield calculator will help you to understand how to calculate percent yield, as well as teach you the percent yield formula and the percent yield definition. Finding the yield is an integral part of any kind of synthetic lab work as the percent yield equation turns your experimental yields into a representation of how successfully you carried out your reaction. Hopefully, after reading this page, you will have an answer to the questions "how to find percent yield?" and "what is percent yield?" We also have a theoretical yield calculator available to you to assist in your calculations! This calculator is not to be confused with a percentage calculator. What is percent yield? The percent yield definition is that it is a measure of the effectiveness of a synthetic procedure. Wordy, right? To put it simply, percent yield tells you how well you carried out your reaction. If you were very careful with your reaction, made sure every molecule reacted and that nothing was lost when you poured the solution from one beaker to another, your percent yield would be 100% (don't worry if you don't get 100%, this is practically impossible). If you accidentally poured your reaction mixture down the drain and lost everything, then your percent yield would be 0%, and if you still had a lot your solvent present with the product, your yield would be greater than 100%. Still confused how to find the percent yield? Check the percent yield equation below! The percent yield equation requires you to know two of the three variables, but it doesn't matter which two! Like any equation, it can be rearranged to find the unknown, but there's no need to worry about this when you can use our smart calculator; just enter the two known variables and find the third. On the topic of smart calculators, you may find our molarity or atom calculators of use in your chemical studies. As you may have guessed from the percent yield equation above, if you want to know how to calculate the percent yield, you need two things, your experimental yield and the theoretical yield (you may need to find the mole or concentration of your reactants to find the theoretical yield). Let's assume you have both values; how to find the percent yield? First make sure the both weights have the same units. Take your experimental yield and divide it by the theoretical yield. Multiply this value by 100 to find the percent yield. There you go, not too complicated right! 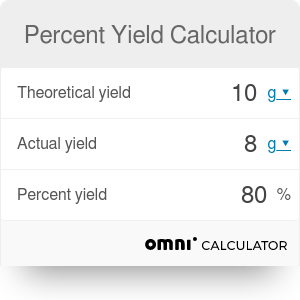 Or you could use our percent yield calculator to calculate it easily and quickly. A note about the values obtained; a value above 100% is possible but is due to solvent being present in the sample as well as your product. Dry your product thoroughly and re-weight to get the true percent yield. Also, a value of 100% is impossible to achieve; there will always be some molecules that do not react or that are left on the side of the glassware. A value of 70% or higher is acceptable! Time for some examples. Lets say you are doing a nucleophilic addition reaction, forming hydroxyacetonitrile from sodium cyanide and acetone. Let's ignore the solvents underneath the arrow; we reacted 5 g of acetone with 2 g of cyanide, giving a theoretical yield of 6.54 g of hydroxyacetonitrile. Now we know that if we carry out the experiment and get 5.58 g of hydroxyactenitrile, what is the percent yield? The percent yield is 85.3%. That was a pretty successful reaction! You should feel a bit more confident at knowing how to calculate theoretical yield now. Let's try another example to bolster that confidence. You react 8 g of calcium carbonate with 9 g of acetic acid, forming 4.35 g of acetone. Nice! Now we do this reaction, but, unfortunately, we only get 1 g of acetone. What is the percent yield? Fantastic! Now you should have a grasp on the basics of percent yield calculation, and with it have the knowledge you need to make the most out of our website. Happy calculating! Percent Yield Calculator can be embedded on your website to enrich the content you wrote and make it easier for your visitors to understand your message.